Mazaika for Mac included a trial version of Mazaika with built-in context help system. To start using Mazaika you need to create a library. You will be prompted to create the library from your iPhoto pictures or may select some folders with images located at your hard drive. If you don't have enough images, you may download some picture collections from this page. (Please see here). Mazaika is a try before buy software. If you like it and want to use it longer than 30 days - you must buy and register it. Single User License: US$ 49.95 Buy online via ShareIt secure online registration! See also the photographic mosaics which were created by the users of the Mazaika. 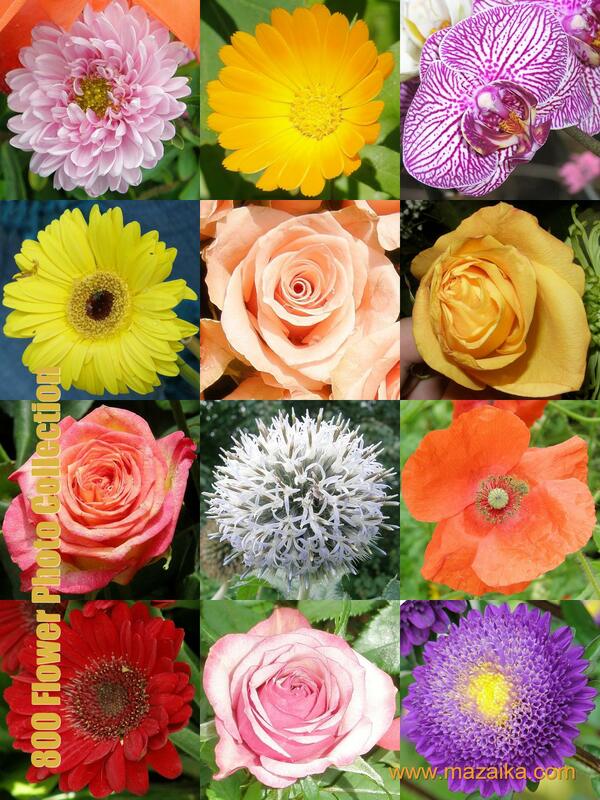 800 original flower photos in jpeg file format. Low-resolution version, 800 tiny jpeg images 44 x 44 pixels each. This free version is good for the Trial version of Mazaika and small mosaics intended to be viewed on a computer display. 1.3 Mb zip archive. Free Download. For Full Version Mazaika and for mosaics printed at high resolution we recommend to purchase high-resolution version of the library. 800 jpeg images 500 x 500 pixels each. 48.5 Mb zip archive. To see 500 x 500 pixels tiles example please click here or on the image at the left. This collection was used to Let a thousand flowers bloom mosaic. Image collection can be used with both MS Windows and Mac OS X versions of Mazaika. Collection of 1,500 Russian magazine and tabloid covers. This collection was used for Johann Gutenberg mosaic. Note 3 - This "ready to use" library can be used with Intel processor Macs only. If your Mac has a PPC processor, you had to create a library from .jpeg image collection. Collection of 1700+ fauna theme postage stamps. This collection was used for large Zoom and Pan Cat Mosaic. There are much more image collections on the main download page.